HURONTARIO LRT PROJECT - PUBLIC INFORMATION CENTRE #2: Tuesday, May 14 @ 3-8 p.m. at CITY HALL (Great Hall). DROP IN. ► Click image below for MEETING NOTICE (PDF). ► Mississauga News article (May 14, 2013): Residents check out LRT plans at public meeting. ► Click here to view all display boards, fact sheets and the FEEDBACK FORM from this LRT Open House. "This is a large, complex city-building project from the lakeshore in Port Credit to downtown Brampton. This next meeting builds upon the design outcomes of PIC #1, and will provide a recommendation for the LRT alignment, the stops, the complete system and its integration." ► Click image (left) for proposed system MAP detail. NOTE: Since recent local meetings about the Harbour Marina Lands and Imperial Oil Lands have included consultants' (controversial) views on extending the LRT even further into Port Credit than shown here, this is an opportunity to have your say! ► City of Mississauga press release (May 8, 2013): Light Rail Transit Display Vehicle Makes a Stop at Mississauga Celebration Square (gives hours). See the Metrolinx LRT display vehicle from May 10-14. ► Mississauga News article (April 24, 2013): Mississauga says ‘yes’ to most transit tax options, and fie on Ford. Caption: "Hurontario LRT. An artist's rendering of the proposed LRT line that would run up Hurontario St., the spine of Peel Region, from its base at the Port Credit GO station to Brampton's downtown. The project is top of mind for Mississauga councillors as they ponder new taxes and fees to pay for region-wide transit improvements." ► What do you think? If you e-mail your comments to the City's project leader regarding #10 rapid transit (Matthew.Williams@mississauga.ca ) please also consider copying TOPCA@topca.net in order that the TOPCA Executive can better represent your views in TOPCA’s response to the City. The Cities of Mississauga and Brampton initiated the Hurontario / Main Street Study in 2008 to develop a Corridor Master Plan that integrates rapid transit, land use and urban design in the Corridor extending from Port Credit to downtown Brampton. A Notice of Completion was published on January 19, 2011. The Master Plan has now been prepared. Light Rail Transit (LRT) is the preferred option. ► NOTE: The section on the 'Port Credit Character Area' is at pp113-119 in Chapter 8 of the Master Plan. The Hurontario / Main Street Study (website) is examining how rapid transit service could operate along the Hurontario Street (Highway 10) and Main Street corridor between the Port Credit area and the GO Station in downtown Brampton. This will not just be a Transportation plan, but a Land Use and Urban Design plan, with a multi-disciplinary approach. The feasibility study began in May 2008. The Port Credit/Mineola workshop took place on Oct. 30, 2008 concerning the section of Hurontario St. south of the QEW to the lake. Click for the presentation. The 'Connect 10' Symposium with City staff, consultants, stakeholders and community leaders took place on Nov. 21, 2008 and focused on the emerging vision for implementing rapid transit along the Hurontario/Main Street Corridor. Click for the presentation. Click for the Hurontario Directions Report (Feb. 2009) and other documents and presentations produced to date. There was a Public Information Centre on June 10, 2009 to review the study findings, rapid transit options and station locations for the proposed BRT or LRT line connecting Port Credit to Brampton. Click for the display panels. February 17, 2010: The Corporate Staff Report dated Feb. 4, 2010 was presented at General Committee of Council recommending approval for the next round of public consultation under Phase 2: Environmental Assessment. The Report recommends Light Rail Transit (LRT) for the Hurontario Corridor from Brampton to Port Credit. Note that implementation is presently unfunded. The next Public Information Session in Mississauga was held on March 31, 2010 at Mississauga Civic Centre. Click for the display panels. A Notice of Completion was published on January 19, 2011. The Master Plan has now been prepared. ► Click for the City’s LRT (Light Rail Transit) Project WEBSITE which includes the presentation boards from the June 26, 2012 PIC #1. ► Globe & Mail article (May 3, 2013): Wynne ‘cleans up’ after minister muses about revisiting transit plan. ► Toronto Star article (May 2, 2013): Transportation minister backpedals, approves Big Move transit plan. ► Globe & Mail article (May 2, 2013): Ontario rethinking Toronto region's $34-billion transit plan. ► Mississauga News article (April 24, 2013): Our LRT is top priority for Metrolinx: City. ► Toronto Star article (April 24, 2013): Mississauga says ‘yes’ to most transit tax options, and fie on Ford. ► Mississauga News article (March 20, 2013): City awaits Metrolinx report on funding tools. ► Toronto Star article (March 10, 2013): Urban-suburban divide grows in Mississauga as city debates who will pay for a real downtown. ► Toronto Star article (August 7, 2012): Hurontario Street: multiple personalities. ► Mississauga News article (June 7, 2012): Taxes needed to solve road congestion. ► City of Mississauga press release (May 25, 2012): Mississauga Transportation Forum Covers Funding Options and Tools. 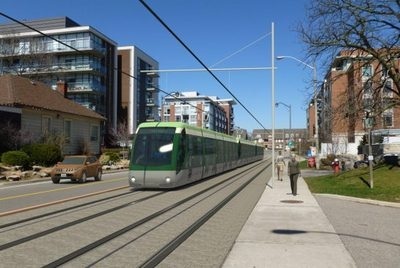 ► Mississauga News article (March 28, 2012): City wants to be ready for LRT. ► City of Mississauga press release (March, 28, 2012): City of Mississauga's Hurontario-Main LRT Project on the Move. ► Mississauga News article (Feb. 18, 2010): Light Rail Transit on track.